Nostalgia In Miniature Workshops: Workshop Last Saturday...And Some Sad Workshop News! Workshop Last Saturday...And Some Sad Workshop News! The first of our two summer workshops took place last Saturday....and what a brilliant day it was! On an overcast June day last Saturday, a truly lovely bunch of ladies eagerly got stuck into The Early 1900s Little German Style Shop workshop project. Luckily this time, there were some different tables and chairs in the room, so there was far more space for everyone. The new tables were big and thankfully each participant had a whole table each and they could really spread out. Some ladies had come already knowing what they would make their shop into and what colours to use. Others arrived not knowing but ready to be inspired. We had a whole table filled with vintage dolls house books and images of various antique miniature shops, which really helped to inspire. Celia also brought her KT Miniatures antique wallpaper for people to purchase if they wished and we are eagerly awaiting to see it in situ! With all the various components and painted surfaces, this is a project that cannot be completed in a hurry and has to be done in stages. So by the end of the day, everyone was at a different stage with the various components, encouraging and inspiring each other. 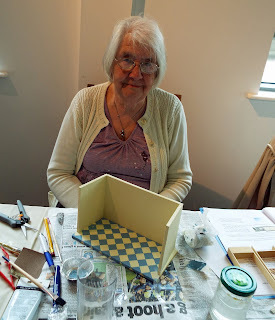 Mary chose to create her 1/24th scale shop floor in blue and cream and was the first to complete the floor. So it was with great excitement but also a little nervous trepidation when the masking tape was finally pulled off to reveal her chequered floor!! But of course it was a magnificent success and very pretty indeed. Janet's little shop is destined to live in her 'village' so a country scene has been painted behind a window which replaces the mirror. As always, we held a raffle in aid of Breast Cancer Now charity which raised £16.00 for the charity . Thank you everyone for your generosity. This will go into the one big pot and after our very last workshop next month, one big payment will be sent to the charity on behalf of everyone who attended our workshops. By the end of the day, it was with great sadness to bid farewell to the lovely ladies, as all had been to our workshops before, and we felt quite choked that this would be the last time that both of us will see them at our Nostalgia In Miniature Workshops. But we hope everyone will keep in touch and have made them promise to send us photos of their projects when completed at home! It is with great sadness to announce that after our July workshop is over, we will be closing the tiny doors on Nostalgia In Miniature Workshops and they will be no more. 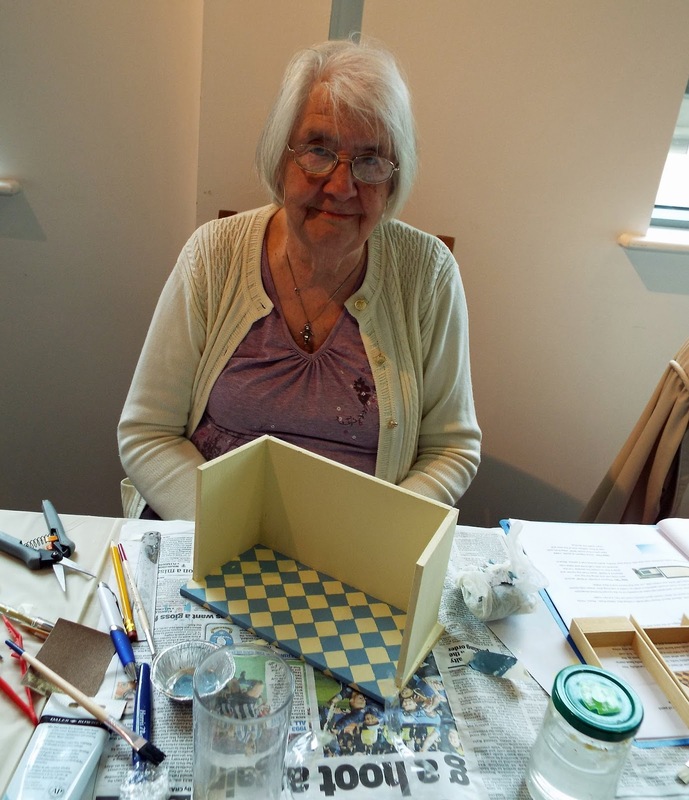 Robin has made the monumental decision to retire and withdraw from the professional miniature scene over the next few months, so the tiny doors will be closing on her Coombe Crafts business too. Her decision has been influenced by a recent milestone birthday and understandably has a lot of real life "stuff" she would like to do while she can. And then for Celia there is the continuing nail biting uncertainty as Mr KT patiently awaits a transplant, so it just seemed apt to end our joint workshop venture at this time. We have created 13 different projects for the workshops since the summer of 2011, when it all began. 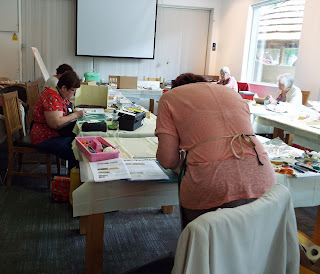 Some of these having been repeated over several sessions, (not to mention several joint "how to make" projects for UK magazines too) and what fun it has been! We've thoroughly enjoyed ourselves, not least getting to know so many people and watching those people grow in confidence and skill with their creating. Don't worry, Celia most definitely has no plans to retire from KT Miniatures for a very long time yet so it may be that in the not too distant future if circumstances deem it possible once more, she will continue the workshops in some shape or form under the banner of KT Miniatures instead. Very soon, a few of our old workshop prototypes will be put up for sale. To be honest, we haven't quite made up our minds which to sell and which to keep just yet, but as soon as we have, they will appear on KT Miniatures website. I am so very sorry to hear that Robin will no longer have her business and will be retiring. I have ordered some wonderful things from her in the past and I will miss her. But I can only wish her the very best and hope she gets to do lots of interesting and lovely things. Glad to hear you are still going strong, Celia!